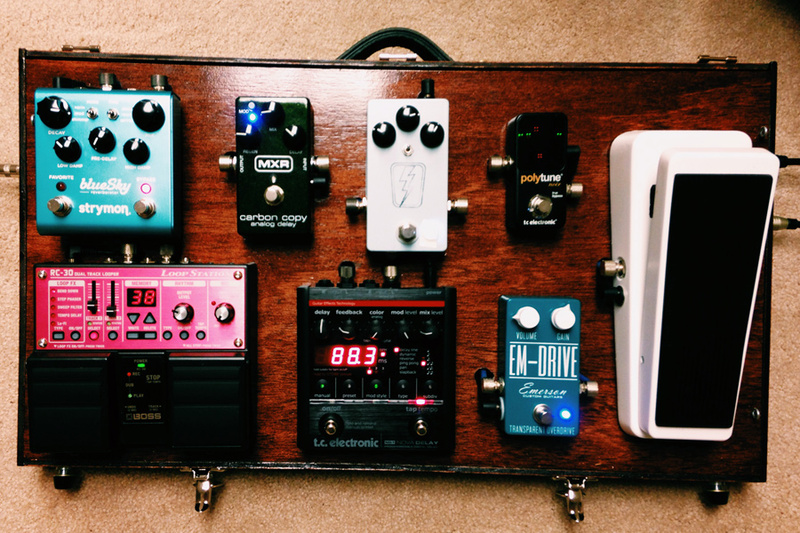 Today’s pedal line is from Kellan Kern. If you have a pedal line (doesn’t have to be in a board) for your rig, please email me a photo, bio, description of pedals and routing to pedalline@nulleffectsbay.com. Every Friday I’ll showcase a pedal line submission. Make sure you include any links to your band or music page. 1. Polytune Noir: I love this tuner, and its compact size is easy to make room for. It is reliable and very fast, and I can usually check tuning in a few seconds with this. It is rather hard to velcro down steadily though. 2. Emerson Custom EM-Drive: This is a transparent overdrive that can be used as a boost and always-on drive, to a nice think overdrive, to an almost fuzz tone if pushed. It is very versatile, stays true to your tone, and sounds fantastic with everything I have tried. I highly recommend it. 3. JHS Superbolt: This is an overdrive that emulates the sagging sounds of an old Supro or Valco amp. It truly does that and sounds great for a nice driven sound. It is very versatile as well, and can go from a light drive to heavy Switchfoot sounds. 4. Blackeye Effects MVP: I had heard many of the problems associated with Ernie Ball volume pedals and didn’t want the footprint of a Dunlop, so I found this from a small company. The pedal is built like a tank, and is small too. The wait time was months, however, and the customer service was very frustrating. Just a warning. 5. MXR Carbon Copy: This is a great analog delay, and for the price, it is hard to beat. The repeats are nice and dark, and for lacking tap tempo, is really easy to dial in to a tempo. This is a really fun pedal. 6. TC Electronic Nova Delay: I would put this delay in the same category as the Boss Giga Delay, and in my opinion, is much easier to use. The presets are a life-saver, and the subdivisions of repeats and the ability to tweak most things allows for a ton of creativity. I highly recommend this as a mid-range priced delay. 7. Strymon Bluesky: I researched this pedal for months before buying, and I was not disappointed. The ease of use was surprising, and the sounds that can come out of it are great. The mod setting covers a lot of ground, and the shimmer setting is beautiful. The ability to EQ the reverb is one of the best things about this pedal, as well as the favorite switch, so I basically have two reverbs at my fingertips. 8. Boss RC-30 Loop Station: This loop station inspires creativity a ton, and even if you are not looking to loop, the drum machine is very useful. It took me quite a while to get used to it, and was not very user-friendly. However, it is now one of the most used pedals I own. I really like how clean the pedalboard looks. To bad there are not more pictures of the board itself. It looks like its tilted up, so i asume the voodoo labs pedal power 2+ is beneath it. I also noticed your cables go into the board, i’m always curieus for things like these, cause one day i’m gonna make myself one too. Your board got my attention because of the white wahwah. I use it too, it’s actually a basswah but i love it on my guitar too. It’s optical so you don’t have to puch it down first to activate it. Also it has a build in boost, so you can dial in and setup the wah so that you don’t get any signal loss! You don’t describe the wah in your signal, so i’m wondering where it is located? Mine is at the really end, after everything (even after my carbon copy, but i never used the two together). I like how it sound after my RAT. Also I was wondering about the Blackeye Effects MVP. I asume thats the white pedal inbetween the polytune and the carbon copy, but what does it do? I can’t find it back on the Blackeye products page either. I’m interested because i’m having trouble with my Ernie Ball volume pedal and yes, they have a huge footprint! So, please explain how its releated to a volume pedal!